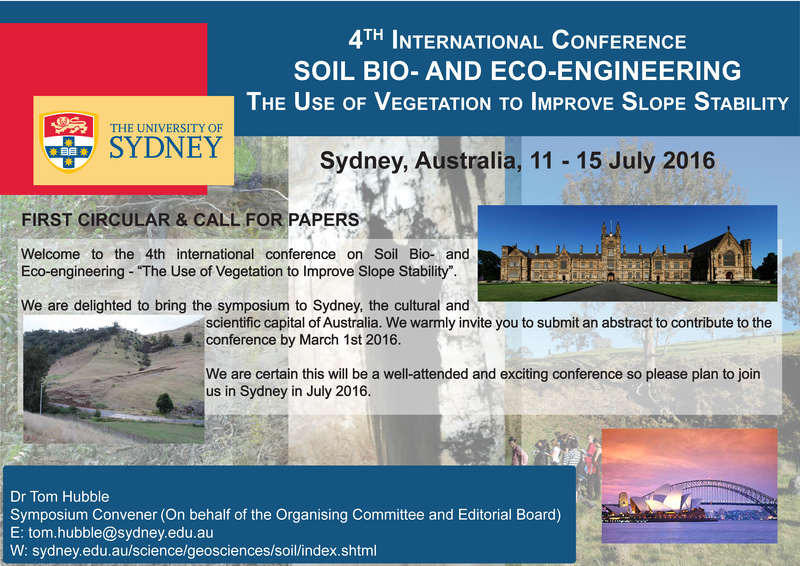 4th international conference on Soil Bio- and Eco-engineering – “The Use of Vegetation to Improve Slope Stability”. A little outside the “Geocoastal” field, but in the spirit of “Source to Sink” encompassing all geo-spheres, and also with the idea that a little cross-promotion never hurt, I’d like to post the first circular to the 4th international conference on Soil Bio- and Eco-engineering – “The Use of Vegetation to Improve Slope Stability”. This conference is headed by Tom Hubble and is taking place at the University of Sydney in July 2016. The full 1st circular can be found here: 4thBioSoilEngo_1stCirc_small and the website for the conference can be found at this link. If you know of anyone who might be interested, we would love it if you could pass on the first circular. I am very interested in joining the conference as a presenter. May I have more details on the submission of abstract and full paper format as well as the payment terms (if any)? Thanks for the interest in the conference! If you follow this link: http://sydney.edu.au/science/geosciences/soil/index.shtml you will find all the details, including the 1st circular, for the conference. The second circular will be released in the next few weeks.